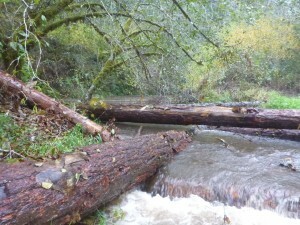 In partnership with the City of Corvallis, the US Forest Service and three private landowners, 4 miles of Rock Creek and 0.2 miles of its tributary, Griffith Creek, were treated with large wood placements in 2008 and 2014. The first placements, in 2008, were on the City Watershed lands. Nineteen log jams were placed by helicopter, utilizing full tree length logs donated from the US Forest Service Siuslaw National Forest. View a YouTube video of helicopter log placement. This was followed in 2014 with the downstream private landowners cooperating to install 11 log structures on lower Rock Creek and 7 on Griffith Creek. The objective of these log placements is to increase floodplain interaction on low terraces and to trap gravels over exposed bedrock that will support cooler subsurface flows, delivering the cool waters emanating from Marys Peak downstream to Greasy Creek. This project was supported by Oregon Watershed Enhancement Board, Coast Range Stewardship Fund, City of Corvallis, US Forest Service Siuslaw National Forest, and USFWS Finley Wildlife Refuge.